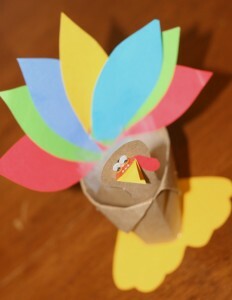 Come visit me at Today’s Mama where I am counting down 10 Christmas gifts to make with your kids. 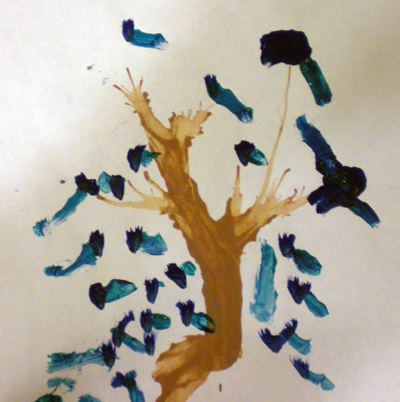 Today we are doing jams and jellies in jars that you paint with your kids. Simple, easy, and really yummy. I made Apricot Jalapeno for friends this year. The girls loved painting away and I love how they turned out! Take a look then make your own. Since the kids will be out of school, why not let them help you decorate? These little turkeys are easy to make and look darling on the table. 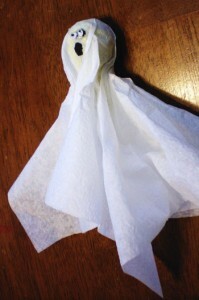 You could also make a larger one to hold chips, popcorn, or other snacks. 1. Make an origami cup by cutting a brown piece of paper into a square. Fold the square horizontally to make a triangle. 3. 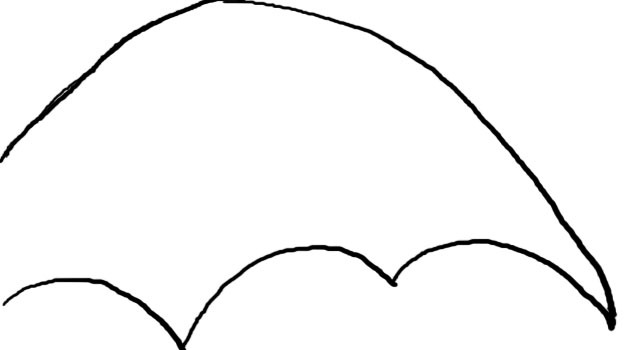 Fold each of the base point(b) to the middle of the opposite side. 4. Now fold the points(a) back down. (One side will cover the two tips(b) that are folded up. This is your turkey’s body. 7. Glue the pieces together and fill the cup with candy or trailmix and write the names of your guests on the feet if you want to use them as place cards. 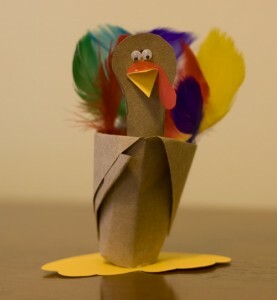 I have been trying to think of something to put a little more meaning into Thanksgiving for us. Honestly, it is usually more about what I am going to make for the dinner than anything else. However, I am trying to make time for more of the meaningful things. I am frustrated by how easily the trivial daily things eclipse the eternal for me. Anyway, this was one idea. 1. Collect a handful of leaves. 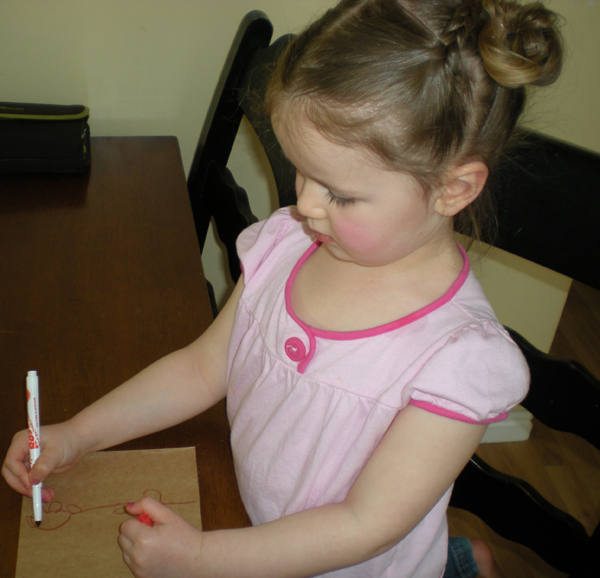 Place a leaf or two under a sheet of paper and rub the side of a crayon gently over the top. 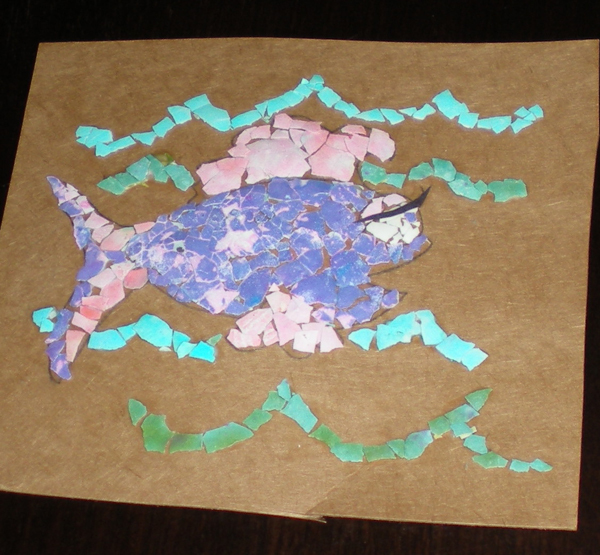 It looks fantastic when you layer 2 or 3 colors. If you do this, start by rubbing lightly and press harder with the second or third color. You can also do the center in one color then add in another on the edges, etc. 2. Cut the leaves out and place in a container or envelope for later. 3. 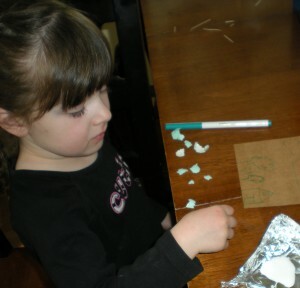 Open the seams on one of the paper bags and cut out a trunk shape that is wider than you want the finished shape to be. Twist and crumple the paper, folding the edges under as you go. 4. Repeat the process, creating a top for the tree by cutting 4 or 5 strips down most of the bag. It will look best if the bottom is cut diagonally so that it doesn’t make a line straight across the trunk. 5. 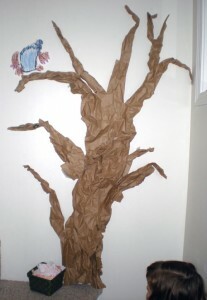 Tape the tree to the wall and place leaves close by. 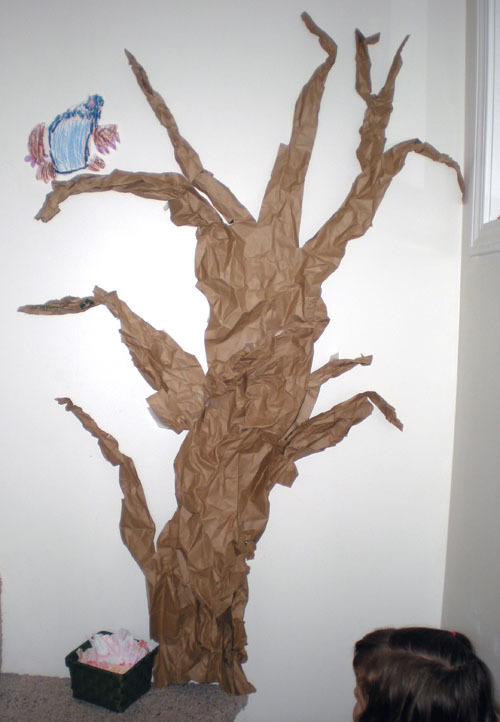 Write the things you are thankful for on the leaves and tape them to the tree. 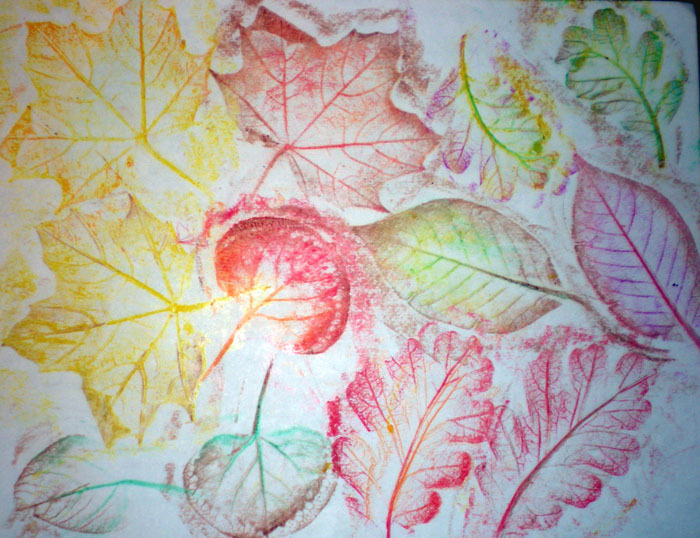 If you use crayon rubbed leaves, you’ll want to write in pencil or crayon. Check out the monster perching on a tree limb. Emily made him and said he needs to be there. She very seriously said “This monster likes to squeeze and pinch kids and eat babies… but not babies in their houses, just ones in the street.” Okay then. Hope your Holidays are meaningful. I definitely want to hear your ideas, what are you doing? 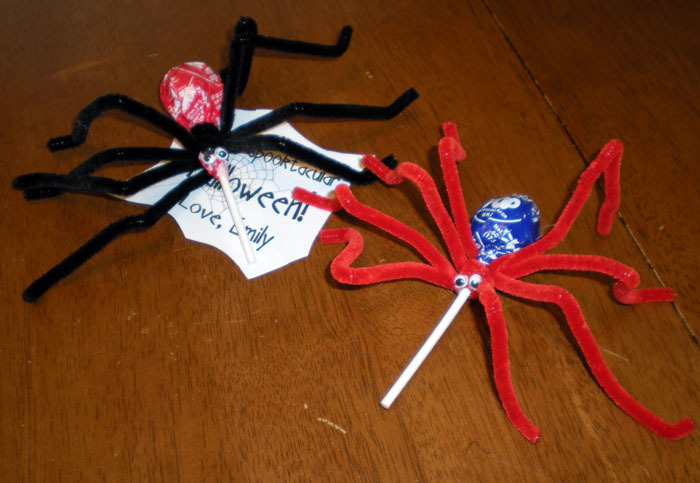 If you are looking for frightfully cute last minute treats for a party or just to give to friends; you can whip up a spider, bat, or ghost sucker so fast it’s scary. They require very few materials. If you have an art box, you’ll likely only need to buy the suckers. 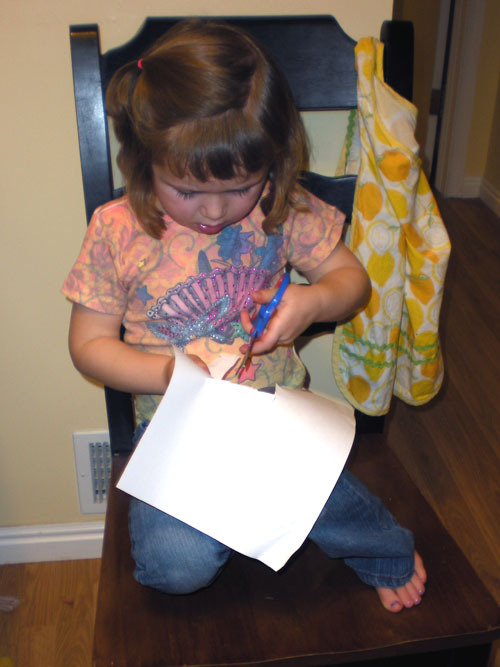 Feel free to copy the tag images into a document and add your child’s name; then just print and cut. 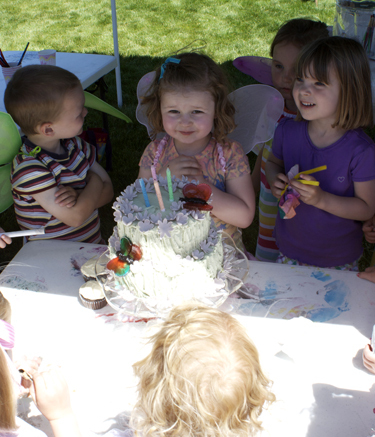 Emily went through 176 ideas before she settled on a butterfly/flower/pink theme for her party. (We edited that down to a butterfly garden party to limit eye-rolls from less girly friends. Anyway, this turned out to be one of my favorite parties to throw. Here is a run-down on what we did in case you have a little girly-girl that might enjoy something similar. 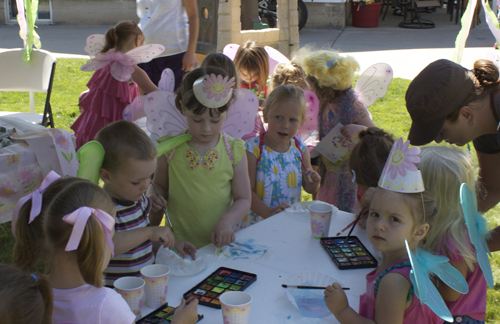 When the girls (and our one brave boy) arrived, they were bedecked with a set of butterfly wings. (Find them, among other things for a great price at Halo Haven.) 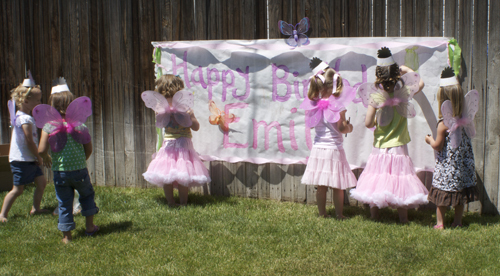 Then the girls were asked to help decorate a birthday banner while we waited for the rest of our friends to arrive. 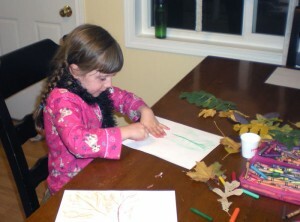 Kids get pretty excited about coloring/painting on a big piece of paper. You can buy a strip of it (for around 15 cents/foot) at any craft store. Then we played a couple of games (the favorite was bug, bug, butterfly, aka duck, duck, goose.) The girls were so excited to paint that we quickly moved to making tissue butterflies (instructions on those to come). Actually, these were such a hit that we barely had time for cake and ice cream and gifts before it was time to head home. Emily was so happy with everything. Look at her making her darling little wish. 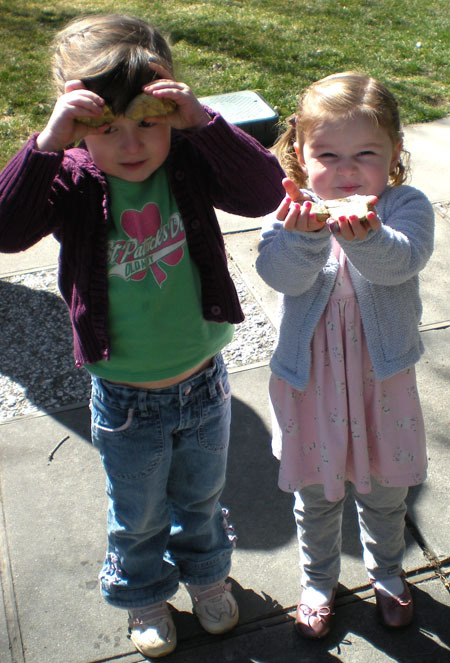 Then we sent the kids home with little bags filled with butterfly goodies and clipped closed with a butterfly hair clip. It doesn’t get much more girly than that. Boys, eat your heart out. 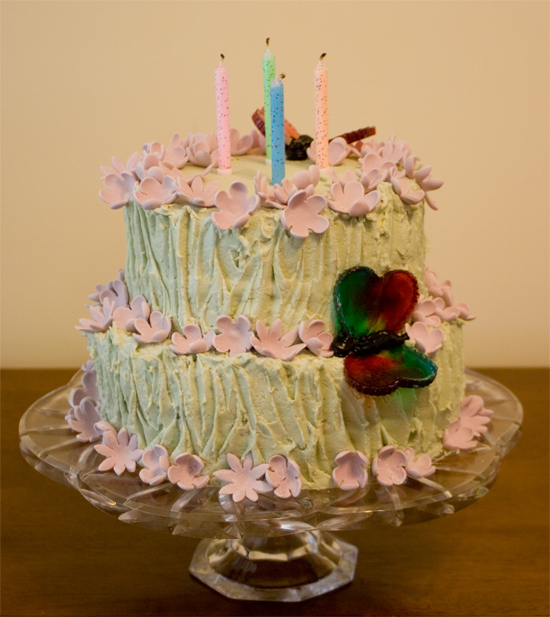 Here is a little cake decorating tutorial for you. I have to warn you though, for all of my good intentions, this was a slightly quick and sloppy undertaking. If you know me, I am often pulling things off “by the seat of my pants.” (Good thing that seat is pretty big.) Hopefully you can get something out of it anyway. Now use the flowers to put the cake together. I am excited that I finally have this (sort of) figured out. I would love your feedback on the video (as well as the project!) I’d also love to start posting pictures of your projects too. I am looking for an add-on to do this, but in the meantime email them to me and I’ll do it manually. My goal is a project a week for the summer; should be fun. 1. If you are using tempra, just drip a little puddle on the bottom of the page. If you are using acrylic, you will need to thin it a little. If the bottle is almost empty, it works great to just add a little water and shake it up. 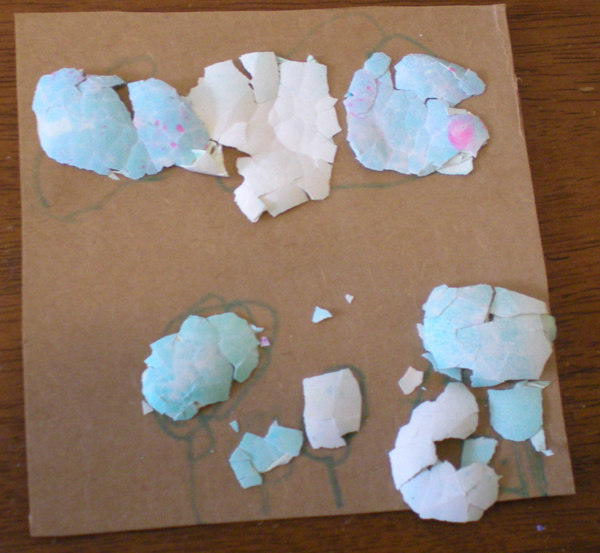 You can also squeeze some paint in a baggie and add water, then squish to mix it. (Keep adding until it is about the consistency of milk.) Then cut the tip of the bag off (keep it small!) 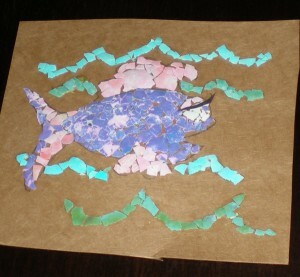 You can also mix in a small cup or bowl and then spoon onto the paper. 2. Put your straw close to the puddle at the bottom and gently blow, directing it upward to create your tree trunk. The paint will naturally want to branch off. You can follow it and blow the paint in that direction to create a branch. 3. 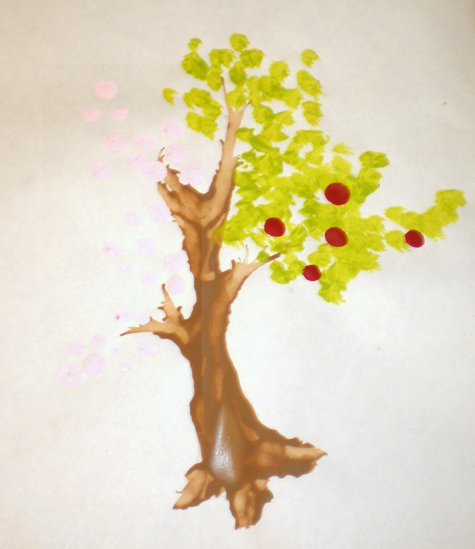 If you run out of paint before you want the branch to end, just add a few drops at the tip and keep blowing. 4. 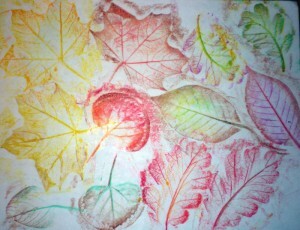 Make leaves with a paintbrush or by dipping your finger tips into the paint and pressing them onto the paper. 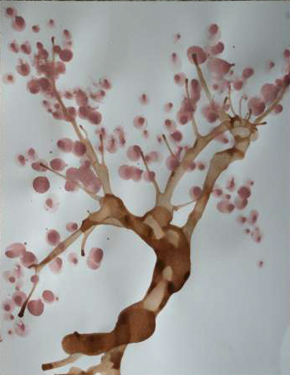 Use this technique to make fruit or blossoms as well. I love these because they have such a pretty, delicate look and it is a super easy project. The great thing is that you can do something like mine in about 30-40 minutes or spend a lot of time and have a frame-able piece of art by filling in the whole picture. *If you don’t have shells from Easter eggs, make an omelet for breakfast and rinse the shells. You can put them into a few small bowls and just barely cover with water. Add several drops of food coloring and let it sit for a minute or two. Drain on paper towels and you are good to go. 1. Sketch a simple design or picture on the board. 2. Using a toothpick, spread glue onto a small section of the picture. 4. 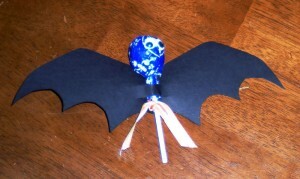 If desired, embellish with glitter, paint or even sequins, buttons, ribbons and such… whatever works with the design. Megan’s house with fluffy clouds and trees. 1. Invite friends. 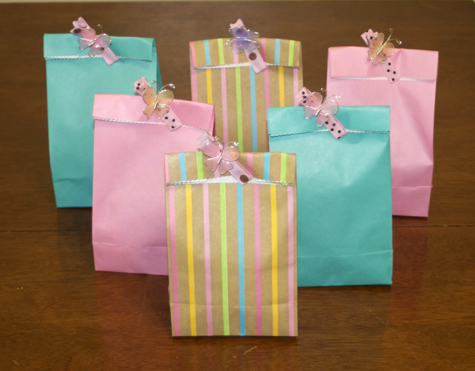 Our hunters were asked to be between the ages of 3 and 11 and to bring a bag of candy per child to share. 3. Hide rocks around your yard. 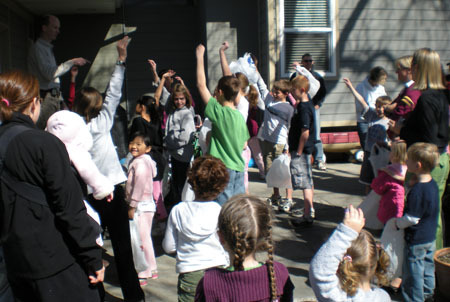 Our hosts last year put the little kids in the front yard (8 and under); while the older kids searched the back yard. 5. 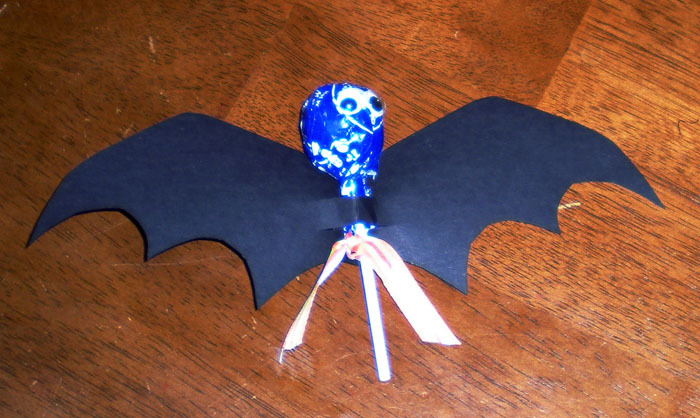 Collect the candy as kids arrive and then divide it into bags while they are occupied with the hunt for the children to take home. If you have older hunters, you may want to distribute based on the number of rocks collected. The families in our neighborhood take turns hosting each year, but this could certainly be a family activity too. The rocks are saved for use the next year. Have fun and happy hunting! 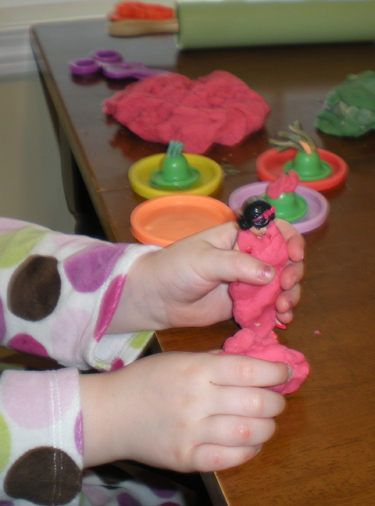 I can’t tell you how many recipes I’ve tried for play dough; but I think I’ve finally settled on a favorite. This one is quick and cheap, with common pantry ingredients. 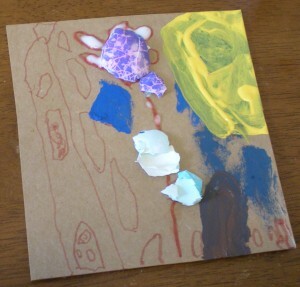 It also has a fantastic texture–just like “Playdoh”. 1. Heat water to boiling in a medium saucepan. If you want one color of dough, add the food coloring now. This makes it very easy to color. If you want multiple colors, you can work the food coloring into the finished dough. 2. Measure a generous 3 1/2 cups flour into a medium-large mixing bowl (one that holds at least 8 cups.) Reserve extra to add if the dough is too sticky. Mix in the salt and cream of tartar. I have to admit that I love the way this feels, so I always use my hands. Salt and flour just have an interesting texture together. Is that weird? 3. Once the water is boiling, whisk in the oil. Remove from heat and add extract. I like this because it makes the playdough-and your hands-smell good. It can smell too good and be tempting for your child to eat, but this dough is fully edible–just not tasty. I prefer lemon because it smells clean. My girls haven’t ever been interested in eating it, but leave it out if you are concerned at all. 4. Make a well in the center of the flour mixture and pour the water mixture in. Stir with a spoon until flour is incorporated, then turn it onto the counter or a cutting board and knead until smooth.